Natural Gas: April contract gas retreated $0.19 to $9.06 yesterday, the first significant decline in gas prices since the first of February. The decline came as oil fell below $100 and amidst the normal volatility of front month expiry. Colder weather forecasts continue to linger but many traders and industry analysts are citing a deliberate attempt on the part of hedge funds to prop up prices and jam the large short position into covering. Despite the recent rally in prices (see link above) this capitulation by the shorts had not occurred as of last week's CFTC data (in fact, the short position continues to swell well into record territory. This morning gas is rebounding about a dime as longs show their continued willingness to buy on any weakness. My Number: 150 - 160 Bcf withdrawal. Year ago withdrawal: 145 Bcf. 5 Year average withdrawal: 146 Bcf. 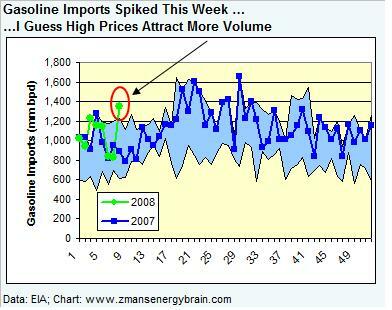 Natural Gas Imports: were a 2.1 Bcfgpd lower than year ago levels (down 1.1 Bcfgpd on LNG and 1.0 on piped volumes). All other things being equal, this would equate to a decline of about 14 Bcf relative to the year ago period. Weather. Heating degree days rang in at 212 last week, vs 199 in the year ago period so we had a little more demand this year, but not significantly more so. Crude oil fell after a bearish weekly report from the EIA, rallied back into the early afternoon hours on a falling dollar and then capitulated into the close. When all was said and done April crude ended down $1.24 at $99.64. This morning crude has recovered the $100 mark and appears to be fixated on thoughts surrounding the OPEC meeting next week. White House Begs For More Oil Watch. At least time the request comes from White House press secretary Dana Perino who at least is a damn sight easier on the eyes than Energy Secretary Sam Bodman. Here's my favorite quote of hers yesterday. "We have to work with our partners, we have to explain to them that having fulsome supplies of gasoline and crude oil is good not just for our economy but for the world economy," she said. Zcomment: Ah, full supplies of gasoline? Maybe she should check out the gasoline inventory chart below. Either way, a new approach is worth a try. Inputs rallied with utilization. I think this is just noise and that the peak of the maintenance season may not yet be behind us. 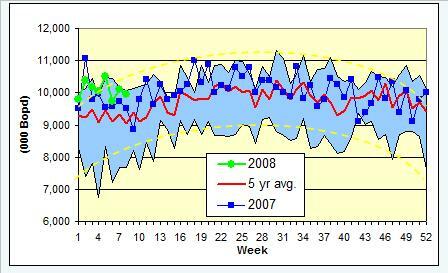 Imports dipped slightly but are still skirting the top of the historically normal range. Something OPEC can point to when they say the market is well supplied. Stocks Climbed More Than Expected, Again. But will this lead to lower oil prices? Considering that this is the 7th consecutive increase and that many of those were bigger than anticipated by the Street I'd have to say no, I don't this will result in a significant decline in oil prices. It's not the "triggering week". It did however prompt a selloff that ended in oil prices just below the $100 mark and profit could set in. Of course, if traders take too many profits off the table OPEC will have an easy choice to trim production next week. At current prices, that choice is much more up in the air. GASOLINE: Bigger than anticipated build on record gasoline production and imports (record for this time of year that is). 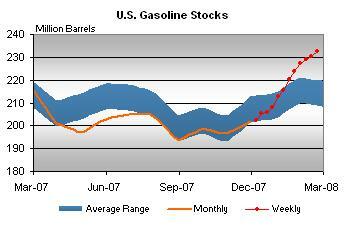 Gasoline Stocks continue to be better and better situated before the beginning of driving season. See yesterday's post for a look at how much of this is related to blending components which essentially means that yes, stocks are high, but the components of the stocks are expensive and not necessarily historical compatible for comparison purposes. (HK) - Picked up the HK April $20 Calls for $0.45. The stock put up a beat but declining oil and gas prices and a yawner of a conference call left the stock off a dime on the day. Everything is humming along at the company like a well oiled machine but management felt that its late January operations update would suffice for now and offered now further updates until the Q&A session. Analysts were a bit put off but the company has an analyst meeting on 3/12 and it will lay out in further detail plays in the deep Bossier as well as results from two more horizontal wells. (WLL) Reported A Bottom line beat. I'm not up to speed on this company but am becoming increasingly interested from the perspective of potential owning the common. Production guidance going up: 2009 and 2010 go to 13 to 15% growth from the previously stated 10% level. 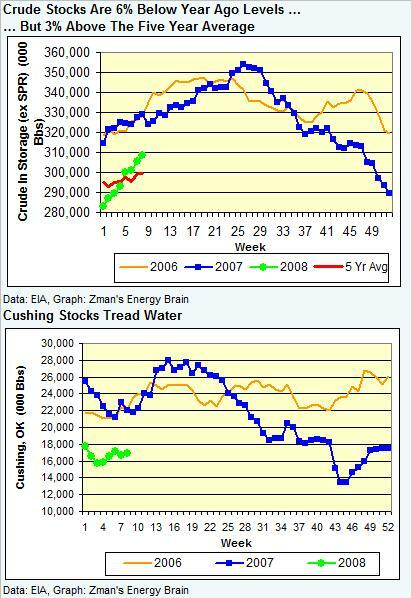 Much of this will be crude, attributable to their Bakken play. They said on the last conference call they are getting more oily and here you have it. Oil in the Barnett Shale - after drilling 8 horizontal oil wells in the Fort Worth Basin they see reserve potential of 225 to 460 mm BOE here on their acreage across three counties. 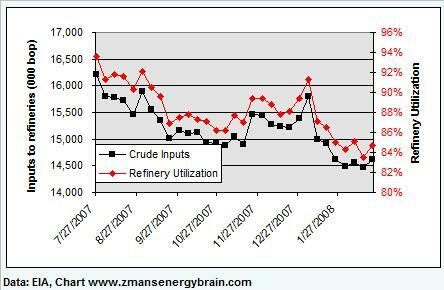 First significant production will come in 2009 (part of the reason for the upped oil guidance. Colorado - North Park Basin - they see 10-80 mm BOE reserve potential here (again, we're talking oil and 2009 when this impacts numbers). British Columbia - Horn River Basin - Drilled 3 horizontal gas wells with encouraging results so far. No economics given, just some IP's in the 3 to 5,000 Mcfepd range. They through out a number for reserve potential of 6 Tcfe here which is pretty stunning given: 1) their normal predisposition towards conservatism and 2) the early nature of the play - they must really like what they see here. Jefferson Davis County, TX - Mississippi Chalk Play where they see 200 Bcf of reserve potential having drilled 3 horizontal wells to date. In summary, they have about 600,000 acres in these four new plays which estimated combined reserve potential of 1.2 to nearly 1.6 Billion barrels of oil (mid point would be 18% of current reserve estimates) and we are looking at a significant add to drilling inventories and potentially further upside as they bolt on more acreage to these plays. They see improvements due to drilling and completion efficiencies in the Barnett shale and are upping their range of ultimately recoverable reserves there by 0.5 Tcfe to a range of 5.0 to 7.2 Tcfe. The stock is going to jump on the open. There will be upgrades of ratings and estimates beginning today and going through Monday. This entry was posted on Thursday, February 28th, 2008 at 8:56 am	and is filed under Uncategorized. You can follow any responses to this entry through the RSS 2.0 feed. You can leave a response, or trackback from your own site. They’re running oil up a buck at the open and ng is jumping with it. EOG is going to be up huge on the open – see post. Analyst conf call starting right now. SINGAPORE — Crude oil futures slipped into negative territory Thursday in Asia on follow-through selling as traders booked profits amid an absence of fresh leads. Bullish sentiment has been undermined by U.S. government oil data overnight that showed a further easing of supply tightness, and while a sagging dollar continued to provide price support, some analysts questioned if this trend could be sustained. “The recent slew of negative economic releases will eventually translate to an appreciable downdraft in equity values, forcing liquidation across a spectrum of asset classes, including commodities such as oil, metals and grains,” said Jim Ritterbusch, president at U.S. trading advisory firm Ritterbusch and Associates. On the New York Mercantile Exchange, light sweet crude futures for April delivery traded at $99.25 a barrel at 0707 GMT, down 39 cents in the Globex electronic session. April Brent crude on London’s ICE Futures exchange slipped 22 cents to $98.05 a barrel. Nymex crude overnight failed to close out in triple digits despite an intraday spike to a record-high $102.08 a barrel, as weekly Energy Information Administration data dented the upward momentum. Commercially held U.S. crude inventories rose 3.2 million barrels in the week to Feb. 22, while gasoline stocks were up 2.3 million barrels — both higher than analysts had anticipated. While stocks of distillate, which include heating oil and diesel, fell for a third straight week, the downtrend followed “the seasonal script very well,” analysts at Barclays Capital, led by Paul Horsnell, said in a report. This turned some of the market’s focus to the Organization of Petroleum Exporting Countries, which is due to meet next Wednesday in Vienna to discuss policy. The 13-member group, which pumps about 40% of the world’s crude, typically cuts output before the second quarter, a period of softer global demand. But such a move is considered politically difficult with oil prices at current levels. The latest crude stockbuild “is slightly more than the seasonal average, and is likely to keep OPEC policy biased toward the cautious for the moment,” the Barclays report said. At 0707 GMT, oil products futures trading was mixed. Nymex heating oil for March rose 14 points to 277.25 cents a gallon, while March reformulated gasoline blendstock stood at 246.50 cents, 127 points lower. ICE gasoil for March changed hands at $889 a metric ton, down $4.75 from Wednesday’s settlement. LONDON — Crude oil production from Eni SpA’s (E) Brass River terminal in Nigeria has been cut by around 50,000 barrels a day, traders of West African crude said Thursday. The terminal can normally produce between 130,000 and 160,000 barrels of crude oil a day but output is thought to be lower as a result of an attack by a militia group over the weekend, traders said. The company wasn’t immediately available to comment. A second trader was more doubtful, expecting tighter supply. “(I) heard about loading delay, possible force majeure is coming,” the second trader said. Sam – Crude down? They need to look again, lol. 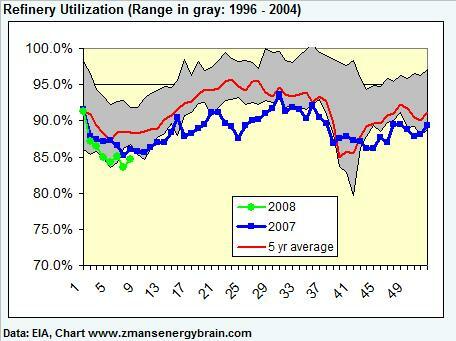 It’s zooming along with gasoline, heating oil and natural gas. Z – That was at 2 am. Morning all. Oil feels like it is becoming almost impossible to trade – absolutely no rationale behind it at all. We have economic data this morning almost confirming the US is in recession (job numbers) and oil soars. $ will be cited along with the usual Nigerian stuff I guess. 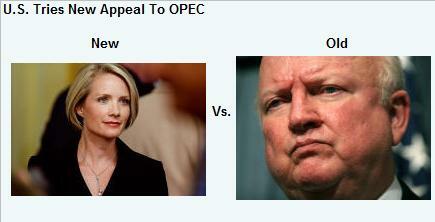 Or are they propping it up to force OPEC’s hand? Sam – ahhhh, thanks…just saw the headline. Nicky – just a Nigeria bump…force OPEC’s hand to raise production? Not likely. EOG opening remarks are better than I’ve heard from them ever and I’ve been going to or listening to this same conference call since the late 1990s. Did you see PF has flip flopped? Stopped on long April crude oil from apprx 10000 at apprx 9900. Buy April crude oil at 10000 – stop 9800. Buy April heating oil at 27200 – stop 26900. Buy April RBOB at 25700 – stop 25600. We’re long April natural gas from apprx 900 – stop 870. Z – the way OPEC have been talking this could just force their hand not to cut production. Take a look at EPL’s results out this AM. If I read this right they produced 8.8 Mmboe and found or bought 3.2 Mmboe in 2007. That’s a 36% reserve replacement. And the exploratory/acquisition cost for this was $201MM! This yields a “finding cost” of $62.81/Bbl. OW! that hurts. Conference call at 08:30 CST. Should be as much fun for EPL as a root canal. Nicky – re OPEC – I agree, thought you meant raise…just don’t see it with those charts in the post. I’m taking notes on the EOG call right now but wow, they are going to explode to the upside, will take some for a day trade and also a long position April or probably longer and will take it on any weakness today. have any of your other fave E&Ps announced an intention of becoming more oily? Seems a reasoable response to the prices. Dman – here and there but nothing to this degree plus EOG is a special case. I’m taking notes on EOG like a madman so I may be a little less chatty than normal this am but look for some EOG trades. CHK and DVN likely to run on EOG which is now up $11 and running. Reef- this is the best conf call Mark Papa has ever had. – they’re coming off like Rock Stars. At the moment nat gas looks like it finished a correction last night and is off to new highs – only a move below yesterdays lows of 8981 would change that. The move down also does have a corrective look which is worrying for the bearish case. WTI has a similar look. SPX is back to a crucial area of support in the 1369 region. ZTRADE: CHK March $45 Calls for 1.90. Equivalent area in the Dow is 12580. EOG – planning to go debt free. Not bumping prior capex estimates to get the upped growth. ZTRADE: EOG April $125 Calls for $5.30. The stock is up $16 now and I took a small position as this is likely to be a multi day run. how log term is this chk trade z? do you think they will mention chk in their presentation or something? ZTRADE: Out second half of HAL $37.50 calls for $1.30, up 189%. EOG going deep in depth on Barnett Shale at this point on their conf call. Reef – I figured it was either them or DVN that would get the run up once people started pausing at the EOG up $15 level! I don’t have time to look but what’s wrong with the broad market this morning – hangover from Ben’s pep talk? NEW YORK — Oil futures rebounded above $100 a barrel Thursday on a reported partial shutdown in Nigerian crude production and speculation a flagging U.S. economy will bring more aggressive interest rate cuts from the Federal Reserve. Light, sweet crude for April delivery was recently up $1.02, or 1.0%, at $100.66 a barrel on the New York Mercantile Exchange. Brent crude on the ICE futures exchange rose $1.08 to $99.35 a barrel. In Nigeria, crude oil production from Eni SpA’s (E) Brass River terminal has been cut by around 50,000 barrels a day as a result of an attack by a militia group over the weekend, traders of West African crude said Thursday. Nigeria, Africa’s largest oil producer and the U.S.’s fifth-largest crude supplier, already has more than 500,000 barrels a day shut in as a result of insurgent attacks and technical glitches, according to the International Energy Agency. Crude settled lower Wednesday after weekly U.S. data showed domestic crude and gasoline stocks rising for the seventh and sixteenth straight weeks, respectively. U.S. oil demand was also softer across the board, reinforcing concerns the world’s most voracious energy consumer could buy less oil amid an economic slowdown. Data released Thursday showed a slowdown was indeed under way at the end of last year, if not a recession. The Commerce Department left unchanged its 0.6% growth estimate for U.S. gross domestic product from October through December, much weaker than the third quarter’s 4.9% growth rate. The number of U.S. workers filing new claims for unemployment benefits rose by 19,000 last week, the Labor Department reported, higher than what analysts had expected. Oil rose in spite of the data, seemingly spurred the prospect the Federal Reserve will cut interest rates again next month, which could pressure the dollar. The the euro shot to a record $1.5150 against the dollar after the jobless claims reports. A weaker greenback has tended to draw more buying in dollar-denominated crude futures, as it makes oil cheaper for buyers using other currencies and gives producing nations reason to adjust their prices upward. Nauman Barakat, senior vice president at Macquarie Futures USA in New York, said there’s now an increased likelihood the Fed will cut its benchmark interest rate by 75 basis points, or three-quarters of a percentage point, to rouse the economy. “As the expectations get more and more towards possibility of a 75-point cut, the weaker the dollar is going to get, and the weaker dollar will act as a further impetus to higher oil prices,” Barakat said. Amid record-high oil prices, traders are watching communications from the Organization of Petroleum Exporting Countries as it prepares for a policy meeting in Vienna on March 5. OPEC member Nigeria’s Minister of Petroleum Odein Ajumogobia told Dow Jones Newswires on Thursday he currently doesn’t support a cut in OPEC production, due to high oil prices. “There’s been a lot of suggestion of a cut (in output), but I don’t think we would support that based on what’s happening with prices,” he said. However, Ajumogobia signaled that his view wasn’t set in stone and could change according to market conditions. Front-month March reformulated gasoline blendstock, or RBOB, rose 1.23 cents, or 0.5% to $2.4900 a gallon. March heating oil climbed 3.29 cents, or 1.2%, to $2.8040 a gallon. Sambone – Thanks I took a little of that last week at 98 but it was too small to report here and it was a whim and I didn’t feel like justifying it to the site as it was pure gut. Z – bad job figures although the futures were well down before that. Broad market starting to wake up to the inflation concerns – Bernanke is going to have to tread very carefully today – they have just released his speech for today – more of the same but expect a contentious q and a session. Stocks fell Thursday after weaker-than-expected economic readings and earnings reports underscored the potential for a recession. The Dow Jones Industrial Average recently was off 116, to 12578. The Standard & Poor’s 500 was off 11, to 1369. The Nasdaq Composite Index was down 16, to 2338. The Commerce Department reported Thursday that the gross domestic product increased a scant 0.6% in the fourth quarter. The reading — unchanged from last month’s initial estimate — underscored just how much momentum the economy has lost. In the prior quarter, the economy clocked in at a brisk 4.9% pace. Initial claims for jobless benefits rose a far greater-than-expected 19,000 to 373,000, after seasonal adjustments, in the week that ended Feb. 23, the Labor Department said Thursday. The previous week was revised up to 354,000 from 349,000. Stocks had a mixed session on Wednesday after the Federal Reserve signaled more rate cuts are likely. In the first of two days of testimony on Capitol Hill, Federal Reserve Chairman Ben Bernanke kept the door open to further interest-rate cuts to boost the economy, even as he warned that inflation pressures have intensified. Investors will tune in again Thursday as his testimony continues. Amid a slew of earnings reports, Freddie Mac reported a steeper-than-expected fourth-quarter loss, as the company recorded $3.1 billion in write-downs and said it expects billions in credit losses in 2008 and 2009. Investors were keenly awaiting the results for guidance on monoline insurers’ woes. Shares were off nearly 1%. Sears Holdings nearly halved its fiscal fourth-quarter net income on falling margins, reflecting increased markdowns as the weakening economy and increasing competition continued to hurt sales. The company’s shares were off 2.6%. Sprint Nextel swung to a huge fourth-quarter net loss as the company wrote off most of the purchase price of its 2005 acquisition of Nextel. Sprint shares slid 7%. Apple shares climbed 4.1% after the company late Wednesday said it’s confident it will meet 2008 targets for iPhone sales and that it isn’t permanently married to the single carrier model it has used for the iPhone so far. The dollar weakened against major foreign denominations after the release of GDP figures and weekly jobless claims. The euro reached a new all-time high of $1.5150, and quickly jumped back from the resistance level. The front-month April light, sweet, crude contract on the New York Mercantile Exchange was trading $1.04 higher at $100.68 a barrel on news of unrest in Nigeria. Gold prices moved slightly lower. In major market action: Stocks were down. Early Thursday, 672 stocks were up and 1,705 were down at the New York Stock Exchange. Bonds were stronger. The two-year note was up 8/32, yielding 1.896%. The 10-year note jumped 30/32, yielding 3.737%. Reef- you watching the single pad drilling expo in Johnson county – monster recent horizontal wells in their Eagle Ford area of JC. Thanks Sam and Nicky – much appreciated. Sometimes hard to come up for air out of energy land. N – What I find interesting is that Moody’s has put FRE on Negative watch (reviewing) because of losses, but affirmed MBI and ABK. Reminds me of Enron. Anybody see anything on the refiners today from the Street? They are getting killed. Hey Sam, you know what EOG used to stand for, right, lol? Z – I’m not seeing anything on the tape for the refiners at this moment. EOG – call going very well obviously. They are about to get out the Barnett (at least for gas). They should go next to the hidden oil play here – they referred to it in the PR and they are going to loosely explain how you get oil, which people knew was in place in the Barnett, but which conventional wisdom says is not recoverable (shale being tiny, tiny pores) so this should be very interesting. Thanks Bill – sounds like a quote for the shameless plug weekend wrap post!!! Refiners-WNR reported 38 cent loss. Estimate had been loss of 3 cents. Refinery gross margin for the quarter almost halved to $5.86 from $10.82 a year ago. The company reported a net loss of $25.5 million, or 38 cents a share, for the quarter, compared with net income of $50.9 million, or 76 cents a share, a year ago. Thanks BOB – that’s two completely lousy quarters in a row for those guys. Asphalt prices hurting along with ??? This has no impact on VLO, TSO, SUN, FTO, buying op in my opinion. Reef – Re EOG – taking notes like a fiend here. This used to be such a boring company – not any more! T – except these guys were spun out before the crash. talk about good timing. cmmmmmmmmmmmon bigger than expected withdrawl…. anyone have the gas numbers? looks like we are having a repeat of this time last week so nat gas will be at 9500 by tomorrow and wti at 10500.
number was in line – this rally is happening because they want it to. you have got to be kidding – how can gas be reacting in this way to that number??? this broad market loves fading the gaps from the open up or down. the market was 4/4 last week. im starting to sound like Phil over here z. ive been reading his posts, pretty insightful guy eh? are you guys buds z? retardational exuberance re NG. look for my wiki page next to delicious double top DDT. Nicky do you follow candle sticks at all? Bernanke comparing houses prices to the dot.com bubble but saying they are not in such a good position to resolve it – very encouraging! – high rock quality with oil was well known…everybody knows you can’t get oil to flow through the tiny pores of the shale. 8 EOG horizontal wells – economical 40 miles E-W, 20 miles N-S – massive. -$2.5 mm completed well cost. -gas is very wet (rich) – will build own plants. -60% of acreage has good frac containment , the viola frac barrier seen in the core of the gas play. -spacing likely to be similar in the central part of the gas play. -took full cores on 3 wells – very extensive technical suite here to determine reserve potential. 10,500 foot well drilled in 11 days – $2.5 mm per well at the deepest. Summary of the impact here: With the addition of the oil play, they are planning to double Barnett Shale total equivalent production from just under 400 MMCFEpd to close to between 860 and 900 MMCFEpd by the end of 2010. Re 62: you’re a funny guy! Basically they are making no changes to their reserve thoughts here. I’ll be out tomorrow from about 10:30 CST on. Drilling on a new play will start at 11:00. It turns out that even in an advanced play such as my mouth, new technology can lead to improvement. Apparently my wisdom teeth are interfering with my bite and they are all coming out at 11:00. I hope to be back in the shop by 2 CST but no promises. Nicky – I finally fiqured it out. This market is like The candid camera gag about “Face the rear”. A group gets on the elevator and faces the rear. Then a person not part of the gag gets on and eventually faces the rear with the group. That’s the markets today, Face the rear. Herd instinct. Now I know. EOG up $20 at $125. My eyes popped out of my head reading the PR this morning. The conference call just keeps getting better and better. Colorado North Park Basin – Another new horizontal oil play. Eog to industry: It ain’t just shale gas- its oil too! Nice on Reef! Wish it had had options. Still way over-valued. Reef – If EOG is going to start producing oil from a shale it makes me want to get the mineral rights on some acreage out west. Remember those oil shale plays in the Rockies in the early 1990s nobody could get to work? wholly crap z i wish i would have takn that eog bast! Yeah T – that was one of the pretty girls. If I hadn’t been messing around with not taking at the open and not been so stingy with my bids I would be smiling more but I’m doing ok there. Refiners just getting slaughtered as , like Nicky said, gasoline not keeping pace with a $2+ rise in crude. nicky re 67: i bought Australian & New Zealand govt bonds for my retirement account today. that pimpco from PIMCO was talking about this the other day. no one wants to buy debt in a country with virtually a 0% real rate of interest, and a falling asset prices vis a vie the USD. re eog, was that their q4 conference call just now??!!! from th 7h or 8th from when they reported? Nicky do you follow candlesticks at all? no – its their annual analyst day. New highs in nat gas now 9420.
finally got to a double on that EOG blast from earlier. Going to hold. The British Columbia talk going on now is extremely positive. Mmmarkkk – great to hear from you! My thought is you’ve got oil shale production which could be tranferred out west and then you’ve got “THE NEXT BARNETT” in Canada. Maybe its CVX or XOM looking to green up like COP for BR 2 years ago. Z- did you get any actual negative vibes from the HK call? Seems you were saying there were holding something back..?? Dman – No, it was just a sleepy call. They have an annual meeting on March 12. Hopefully, they will drink some coffee before it. EOG getting into the more boring, routine existing plays. Stock may come off a bit here before ramping into the analyst Q&A session. That NFX chart is on the verge of breaking out. Out EOG April $125 Calls for $10.50, up 98% in 2 hours. Never look a gift horse in the mouth. I’ll be back here before day’s end. WTI has support at 101.25 and 100.50. Can’t get too excited about this pullback as it looks corrective right now. Did anybody ever find out why the refiners were being dumped? rbob only up 113 points. this is nuts! truly. its not about energy anymore which makes it even more dangerous. just a flee to something they perceive as being safer. Ram – all I can see is the miss at WNR (which makes little sense) and the failure of gasoline to keep pace with oil. 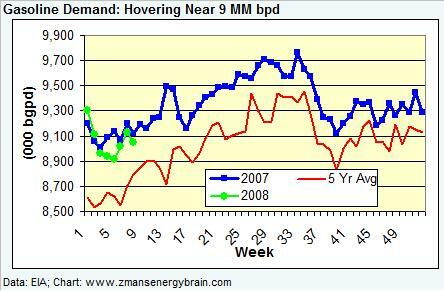 Mark Papa at EOG said they stopped hedging gas 3 weeks ago for 2008. They have about 30% of expected gas production for this year hedged in the mid $8s. They think gas prices will be higher, tight supplies on LnG, production not as high as govt data indicates, and see storage peaking next nov at “only 3.3 Tcfe” They think additional hedges would have a 50/50 chance of hurting them. Most of the old “oil shale” out in Colorado and Utah is already locked up in land grants, etc. Big holders are Shell, CVX, XOM, COP and others. EOG has some, I think, but not sure. Shell and CVX are spending big bucks with pilots, etc. But this stuff is way different from Barnett oil shale. This has to be heated/retorted in place or mined. DOE has lots of papers somewhere at their website which is where I did the research. This Barnett oil shale is really great stuff. Papa has made a great thing out of the old Enron oil days. Of course, he started his career long ago at Continental Oil…aka Conoco. What a swing! Maybe this is how BP’s going to keep their production level over the next many years! Shell could do a lot worse…like plunking a few billion dollars on frozen Artic offshore! wll conf call drilling alot of wells with eog in the parshall nd bakken and prob 30 wells on their offsetting acreage at the Robinson Lake . In answer to 1 questions prob sandbagging prod est and will revisit with prob upgrade. their co2 projects should kick up this yr. best place to find oil is where u already have. hes has 1 of the largest co2 ops in the world about 30 miles away.when u look at sd presentation look at how many candiate fields that there r in this part of w.tex. sd said they would give the co2 away free so they could produce the menthane. sd should have a good call on 3-3-08. Mark – I know about the problems out west, was kidding but listening to the call, these guys sound like alchemists so you never know, LOL! I was thinking XOM made sense since they are trying to look green (all that gas!) and they got the currency in terms of a pricey (on an earnings multiple stock) so it could be accretive quick in a stock for stock (well, before today anyway) and they are trying to grow N. American gas production as of last conf call – at least that’s what I remember someone saying they said. They just said they are evaluating but not really talking about the Marcellus. Tex – agreed with the good call. I own SD common. Did WLL have anything cautious to say about the Bakken? – EOG sounded like the play is going fine but that recent results don’t allow them to up the size of it. Mark – maybe that’s why XOM is flat to down today with all the other majors up, lol. EOG conference call finally over. Um, pretty positive all in all. Will have a post out on it later tonight. Nice to have taken profits in HAL and all but man, that thing is smoking now. waiting for this EOG to edge lower, then I’m going to take some $150 Leaps. NFX very much working now, at new record highs. The 4Q pattern continues … announce good results, analysts go “mumble, mumble, mumble” then see the stock move on up. Happened with APC, NFX …next up: HK. they are really running crude now…. Refiners are down IMO because the House passed the Energy Bill. No other news that I can find. Sam – what’s in that bill that anti-refining? The bill targets a tax break that Congress provided in 2005 to help domestic manufacturers. It also would limit the amount of tax credits the largest U.S. oil companies could claim under that law. The bill also would limit the tax break provided to oil companies in connection with foreign oil and gas extraction. Sam – so you think the manufacturing component is what’s hurting them. Everything I’ve seen in the press has focused on drilling incentives (which by the way are not triggered at current prices). The only guys down today are the domestic refiners. They don’t drill for anything. Are you saying they are going to be penalized for making gasoline or a tax incentive even exists for the manufacture of gasoline because that would be news to me? Got a link to the bill handy? Z – I’m guessing more than knowing. That’s the only thing that I can come up with watching the refiners going down with no news. Researching now on the bill. WSJ – Oil and gas companies would lose some $13.6 billion in tax breaks granted in 2004 for domestically produced goods. Exxon Mobil Corp., Chevron Corp., ConocoPhillips, Royal Dutch Shell PLC and BP PLC would lose the tax breaks entirely. The deduction would be frozen at 6% for smaller oil and gas companies. That deduction had been scheduled to jump to 9% in 2010. 185,305 gross,96,503 in Sanish and Parshall field. 33 wells drilled 2007,approx 30-40 operated and 20 no-operated wells planned for Sanish in 2008. Approx 50-60 non-operated wells planned for Parshall field in 2008. Avg est 400-500 MBOE well. They are very positive that all wells will be successful. No mention about acquisitions, but I am pretty sure they are in the due diligence phase. Cramer has an article out boosting NG. Well, actually he kinda sorta has, if you follow *closely* enough but I think he gave up on them at least 50 times as well. Z – I haven’t been able to split a bid today to save myself. Even when things were moving down like HK. So I decided just to pay up…and no regrets yet. But normally I can split some of them… any clues? Z – Guess I’m wrong. I read the bill and hell, I can’t even understand it. Doesnt say anything about refiners (I guess). If you can read it, by all means, go for it! Deutsche Bank calling for $150 oil within 2 years. why is the dollar near a low? Thanks for the link Sam, will peruse later but I can’t imagine them touching the refiners = political hara-kari. NFX breaking to all time highs…life is good. On bid splitting I find it very difficult on up days like this…much easier on waffly days and almost as hard on big down days unless they keep going down and your mid becomes the offer, lol. Somebody just sent me the Cramer loves gas piece. Little late to the party pal but he does know how to jump on the bandwagon. Technically $ looking stretched. there is some bullish divergence. due a short term bounce. EOG decline on a tick chart pretty apparent. Just a bit more and I’ll be going back for more. The first call notes will start coming out in the morning with the best out tonight on this site, sorry, I mean on Monday when the bigger reports are out. bill – don’t think it will last but I take a portfolio approach to this game. NG short may smart but E&P and Oil Service rally is impressive and moving on to new highs. I’ve been selling into that strength. anyone think we get a hydrocarbon rally into the close for open outcry? OII trying to join the list of earnings “disappointments” that are in rally mode to new highs. HK higher than before the conference call now. Shell guy on SNBC saying they’re refineries running flat out and they are not seeing any significant reduction in demand for finished products. Hey Nicky or Sam, did Phil Flynn have any reason is his post for flip flopping? WTI closing at highs of the day – more to come. Finally warming up some in SoCal as well. This has been a cold winter here. NFX up $2.75 to $56. Daily chart in full break out mode. Big cap E&P rocking: APA and DVN all breaking new ground. APC a few bucks away but looking like it will punch through soon. APC has quietly gotten oilier too. IOC dribbling lower…glad to be away. Will come back for some Aprils calls on a really bad day (with no news) here. Popeye – a lot colder than they initially forecast. Up next…hurricane season. Thanks Sam – Just read it. Hilarious. He’s re-writing the things that matter to the crude trade based on this recent surge. Its all sarcastic and he doesn’t really go and say buy oil but he does say to catch him on the Fox Business Network and Skynews which is pretty nice exposure I’m sure. “But the U.S. government has a technology, called a printing press (or, today, its electronic equivalent), that allows it to produce as many U.S. dollars as it wishes at essentially no cost. By increasing the number of U.S. dollars in circulation, or even by credibly threatening to do so, the U.S. government can also reduce the value of a dollar in terms of goods and services, which is equivalent to raising the prices in dollars of those goods and services. We conclude that, under a paper-money system, a determined government can always generate higher spending and hence positive inflation”. I’ve been banned from sending emails to Alaron. Now I just get an automated bounce back. And I thought we were friends. what was oil’s high so far? oil flying in the after market, up $3.15 at 102.77, tripling the move in gasoline. Cracks will get hammered on that. wti near 103 after the close. $ new lows. Dman – I know but better safe than sorry, made good cheddar there. The way the energy sectors are moving we may see further strength into the weekend. More broad market money is slamming into the stocks. Only the XNG is at all time highs. NG up more with oil and inflation than any other reason, the storage number basically means we treaded water with the 5 year average and year ago levels. Looks like no end in site Z re oil. I presume energy stocks are holding up the broader market again? ZTRADE: Entered APC $70 Calls for $1.80. NEW YORK — Oil futures roared to a fresh all-time high above $102 a barrel Thursday, bolstered by the dollar’s slide to new lows. Light, sweet crude for April delivery was recently up $2.67, or 2.7%, at $102.31 a barrel on the New York Mercantile Exchange, beating the prior intraday record of $102.08 a barrel reached Wednesday. It earlier reached $102.64 a barrel. Brent crude on the ICE futures exchange rose $2.39 to $100.66 a barrel, also topping its earlier record. Heating oil futures also rose to a new record of $2.8400 a gallon as cold-than-normal temperatures were forecast in the Northeast next month. 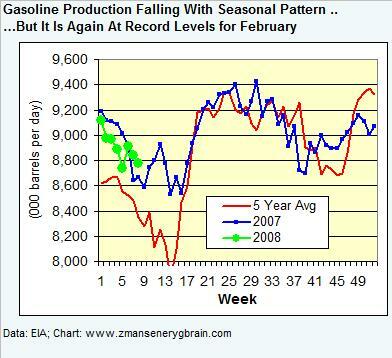 Front-month March heating oil was recently up 6.64 cents, or 2.4%, at $2.8375 a gallon. The dollar’s recent declines has drawn buyers to crude and other dollar-denominated commodities, analysts said. A weaker greenback has tended to draw more buying in dollar-denominated crude futures, as it makes oil cheaper for buyers using other currencies and gives producing nations reason to adjust their prices upward. “In view of a 50% devaluation of the dollar, people are moving into any kind of a market that they think would preserve purchasing power, and black gold is one of them,” said George Gero, vice president of global futures at RBC Capital Markets in New York. The euro hit a new lifetime high above $1.5200 against the dollar Thursday, rising nearly 1% on the day amid expectations for further declines in U.S. interest rates. A second day of Congressional testimony by Federal Reserve Chairman Ben Bernanke, who repeated his gloomy view about the U.S. economic outlook, has reinforced the belief the Fed will continue to cut interest rates at its meeting next month. Supply jitters also bolstered the crude market early on. In Nigeria, crude oil production from Eni SpA’s (E) Brass River terminal has been cut by around 50,000 barrels a day, traders of West African crude said Thursday. An Eni spokeswoman based in Rome confirmed there had been some disruption to flow along a secondary crude pipeline which feeds in to the terminal in recent days, and that some output had been cut following a technical problem. Nigeria, Africa’s largest oil producer and the U.S.’s fifth-largest crude supplier, already has more than 500,000 barrels a day shut in as a result of insurgent attacks and technical issues. Crude settled lower Wednesday after weekly U.S. data showed domestic crude and gasoline stocks rising for the seventh and sixteenth straight weeks, respectively. Total U.S. oil demand was also softer, reinforcing concerns the world’s most voracious energy consumer could buy less oil amid an economic slowdown. Oil rose in spite of the data as the dollar weakened, observers said. Front-month March reformulated gasoline blendstock, or RBOB, rose 2.14 cents, or 0.9% to $2.4991 a gallon. That said there will be late length entering that stands to be slaughtered when they turn this. #152 – colder than normal temperatures next month??? I thought it was going to warm up? Z – re HAL: no one’s going broke making 189%, that’s fer sure. What I’m trying to figure out is how old HAL is leading my list of service gainers. Almost 5% up. Maybe it’s some of that “broad market money” you mentioned & they only know the old, big names. Agree very much with 153. Very, very much agree. How we don’t go to $105 now is not apparent to me. Bigger daily increments in the price of a barrel of crude are becoming the norm. D – but they know SLB’s ticker at least as well as HAL’s …its got to be valuation prompting them to go for the much cheaper name, the name with the new and improved international story, and the name with a ton of gas exposure. I will be surprised if we don’t get a pullback in commodities tomorrow. but it won’t be the final top imo. $ should get its small bounce. Nicky – thinking we get a rally overnight or in the morning and then a drop but it could mount a move on $105. I don’t how many traders want to be long extra contracts going into the weekend though. NFX absolutely on fire. Looks like the CHK chart did two weeks ago on a monthly chart. Big long, somewhat erratic base, now breaking out. Z – re. 156 on HAL. Thanks for reminding me… I’d forgotten why *I* was liking it. The market can have that effect. Well the Elliott wave count shows wti in the v of iii which could terminate anytime. We then get a pullback in iv before the final wave which is v of (v) of 3. One can only base estimated targets for wti on fib relationships but a possibility for the final v of (v) is 105.50. HK sitting right at the upper line of the Nov-Feb down-channel. HK feeling the love with volume. The natural gas guys just won’t say it. They will not speak up for themselves. As they discover we have more and more natural gas — the cleanest fuel around — than we thought, as they raise estimates of reserves — today being EOG’s (EOG) day, we see the future of low food and gas inflation and we just ignore it. This stuff is driving me crazy. Think about it, Devon (DVN) , Anadarko (APC) , Apache (APA) , Southwestern (SWN) , XTO (XTO) and Chesapeake (CHK) have been raising reserves remarkably. The stuff is abundant. We have more of it than anyone thought. We have a price of gas that would not match oil until it goes to $16 — that’s from Bob Simpson from XTO — and we have it here, safely, domestically. Off camera, these execs are incredulous about ethanol and the need to burn our food. They cannot believe that we have an ability to bring down oil and bring down the price of food simply by relying more on this fuel. But we are relying less. I cannot believe this. I cannot believe that it is all happening like this. How could our country be so wrong? How can we talk about nuclear — which no one is going to let be built — clean coal — which is too expensive –and oil, which is in the hands of OPEC/terrorists, when we have plentiful, terrific natural gas that we could give incentives for to drill even more. The nat gas lobby is nil. It has no support. The president, who knows this market well, says nothing about it. I have been behind these stocks forever and they are almost all at 52-week highs. Coal’s a loser. Sorry. We can ship it overseas, but as the Democrats gain strength, you can forget about coal as a fuel. Just forget about it. The future is natural gas. The market knows it. The politicians simply won’t go for it. Neither will the utilities. Take a look at EOG, APC, APA and XTO today. Look at these prices. They are telling the truth. It stung me badly yesterday when Hillary Clinton said I didn’t understand the complexity of the ethanol situation. With all due respect, I have done much more work on it, have thought it through far deeper than she has, and recognize the real weaknesses and political consequences of growing a fuel that is making so many poor people struggle, that is bringing up inflation radically and that isn’t even being allowed to be reduced because of the Brazil tariff. I could care less about which state votes for whom. But anyone who cares about national security and inflation knows that nat gas is the answer. At the time of publication, Cramer was long XTO Energy. NEW YORK — Oil futures soared to a record all-time settlement above $102 a barrel Thursday, bolstered by the dollar’s slide to new lows. Light, sweet crude for April delivery climbed $2.95, or 3%, to settle at $102.59 a barrel on the New York Mercantile Exchange, well above Tuesday’s previous record closing price of $100.88. The contract continued to rise in electronic trading and was recently at $102.97 a barrel. Brent crude on the ICE futures exchange rose $2.66 to $100.93 a barrel, also topping its earlier record. Crude futures have risen in four of the five last sessions as a pronounced slide in the U.S. dollar pressures oil exporters to raise prices and draws investment funds into commodities. Gold, corn and soybeans all also broke records Thursday. The euro shot to a new high above $1.5200 against the dollar, rising nearly 1% on the day amid expectations for further declines in U.S. interest rates. Federal Reserve Chairman Ben Bernanke reiterated a grim outlook for the U.S. economy in a second day of Congressional testimony, reinforcing the market’s belief the Fed will continue to cut interest rates at its meeting next month. Bernanke’s concerns about a slowdown were substantiated in data released earlier in the day. The Commerce Department left unchanged its 0.6% growth estimate for U.S. gross domestic product from October through December, much weaker than the third quarter’s 4.9% growth rate. The economic reports came a day after the U.S. Energy Information Administration reported domestic crude and gasoline stockpiles have risen for seven and sixteen straight weeks, respectively, while total U.S. oil demand was also softer. But the dollar seemed to have a stronger impact on the oil market than the specter of weaker demand. Supply jitters also bolstered the crude market early on. In Nigeria, crude oil production from Eni SpA’s (E) Brass River terminal has been cut by around 50,000 barrels a day, traders of West African crude said Thursday. An Eni spokeswoman confirmed there had been some disruption to flow along a secondary crude pipeline in recent days, and that some output had been cut following a technical problem. A forecast for cold next month in the Northeast, the world’s largest heating oil market, helped drive March heating oil futures to a new record settlement of $2.8456, up 7.45 cents, or 2.7%. March reformulated gasoline blendstock, or RBOB, rose 1.80 cents, or 0.7%, to $2.4957 a gallon. Both contracts expire Friday. Wow that was a long day. I’m going to call tini time 2 minutes early. Love the move in HK – green on both sets of options for first time. Whiskey Tango Foxtrot re the drybulkers today. Rates were up, group was weak again. I assume its just going back to being tied to the broad market, right Bill? Also, shorts are coming into some of the names/ 24 5 of drys float has been shorted and 15 dollar movees from low to high is becoming a weekly occurence. some rather worrying markets after hours. broader indices off quite heavily now with Asia opening much lower. US futures below some key support areas. Why is UNG still going up? Natural gas rallied with oil, climbing 4% on an “in line” storage withdrawal. This a full on short squeeze except that the shorts, at least so far, have kept replenishing the trade as gas rise.